Vacation rental cottage. Sleeps 6, 3 bedrooms, 3 bathrooms. Cats, Dogs allowed. Tybee Twins front yard. We have a wonderful screened in porch we want to share with you! And a fantastic new heated swimming pool in the backyard! Picket fence at front of Twins. Backyard is fully fenced (with heated POOL) but the front yard is not fully fenced. Tybee Twins is pet-friendly! Walk into the the living room from the french doors and sit down! 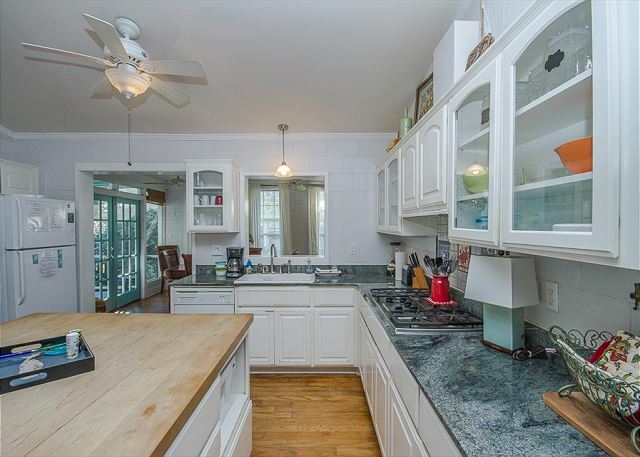 Open floor plan flows into kitchen. Living room overlooking the front screened porch and 5th Ave. Living room off front porch. 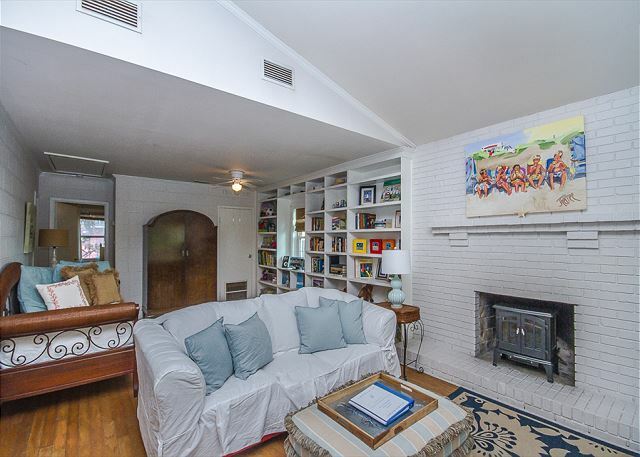 Living room with a ton of books and games. Wonderful kitchen. Stove is now electric! Kitchen flows into living room. Dining room is to your left. Kitchen. Double ovens for lots of cooking and baking! Dining room is off the screened in front porch. So many exquisite choices for seating and eating! Dining room table (and that oyster shell lamp again) looking out French doors onto front screened in porch). Bathroom #1 downstairs. Standup shower with fabulous vintage tiles. Fun bathroom #1 downstairs. This cottage is rare in that it has 3 FULL bathrooms. Standup shower. Seating area by dining room. Stairs lead to private king suite with full bathroom. King bedroom downstairs. It also has its own bathroom. 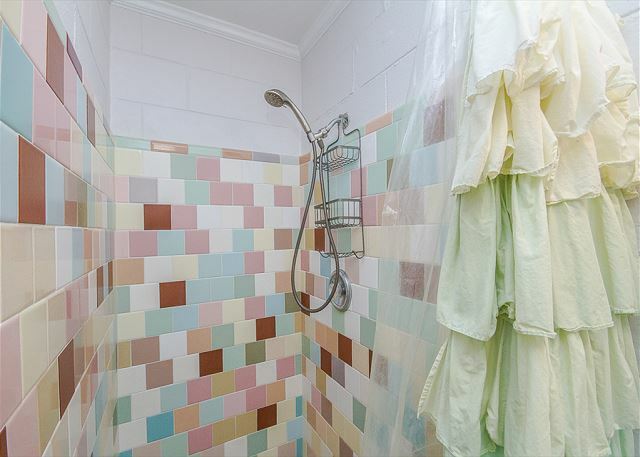 Standup shower with colorful vintage tiles. What a treat to shower in here! Vintage tiles make this bathroom extra special. Sea and Beach twin bedroom. Sea side of the Sea and Beach double twin bedroom! Sea and Beach twin bedroom. There are three full bathrooms and three full bedrooms! King bedroom #2 ~ upstairs. Has a full king bathroom to the left. King bedroom suite upstairs. This has a private full bathroom and is the only room upstairs. Full upstairs private bathroom. 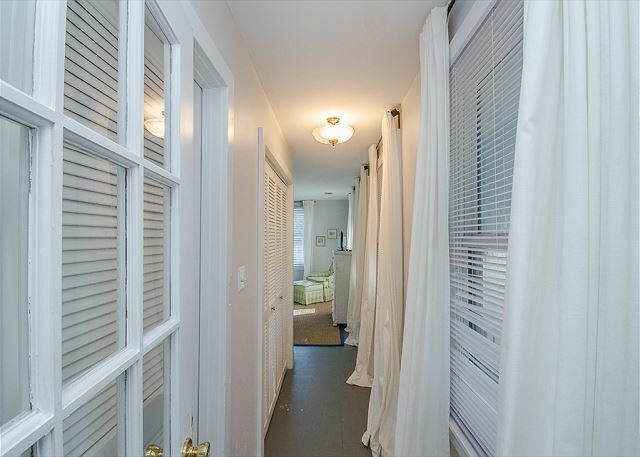 This home has 3 full bathrooms, a rare treat in vintage cottages at the beach! From the master bathroom upstairs to the king bedroom. Sit and relax! Love these turtle chairs! 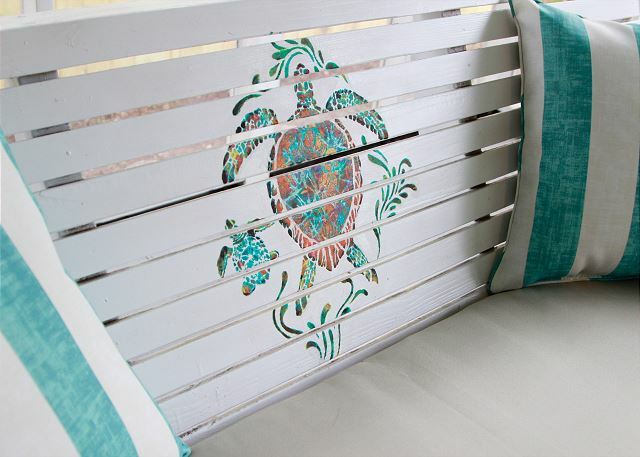 Beautiful sea turtle details! Sea turtles nest on our Tybee beaches, so please use smarts when being on the beach! Take extra litter home with you to throw away! 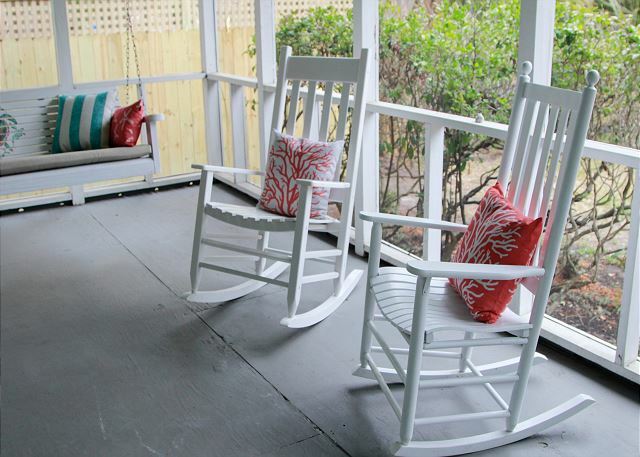 Rocking chairs on screened porch. Our brand new (January 2018!) PRIVATE swimming pool! Amazing pool will make your Tybee (Twins) experience the best! 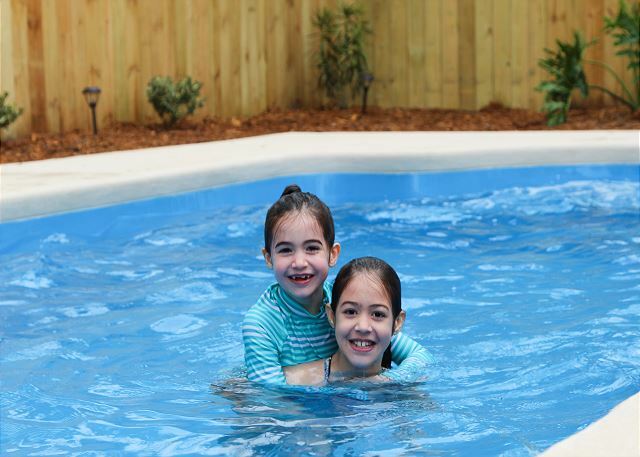 Come enjoy the great new pool at Tybee Twins! Jump in! The water's fine! Tybee Twins pool at dusk with lights! Come see us soon at Tybee Twins! 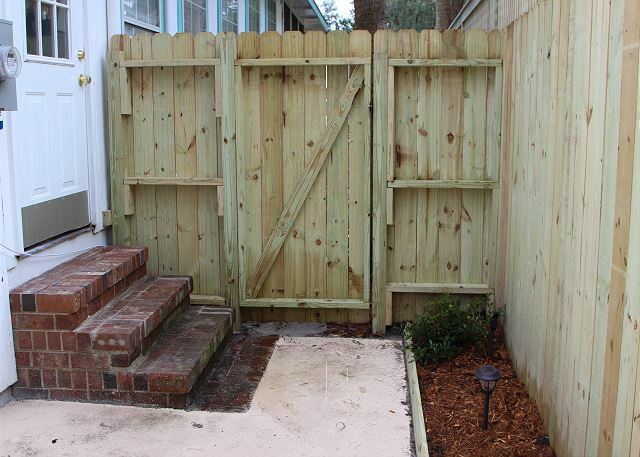 Path from gate to backyard pool area. Kitchen. Opens to dining room. Living room opens into kitchen. Living room. Electric fireplace for cozy nights. Local art, family photos and lots of books and games. Electric fireplace. Wonderful vintage tiles in the bathroom. Remember there are 3 bathrooms in this cottage! 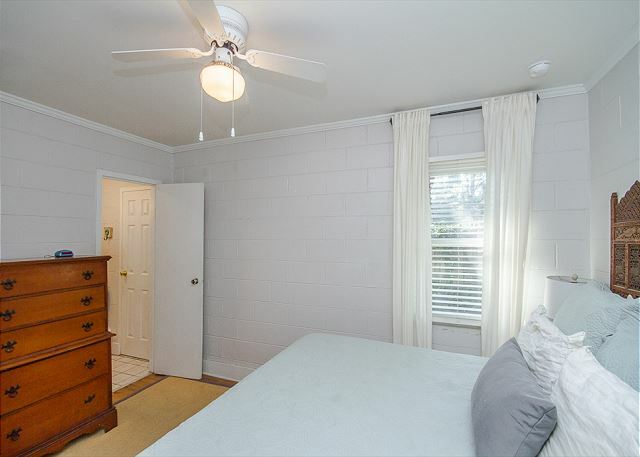 Twin bedroom in classic cinderblock Tybee room. Sea and Beach. What is your choice? Sea and Beach twin bedroom downstairs. Sea and Beach twin bedroom downstairs. 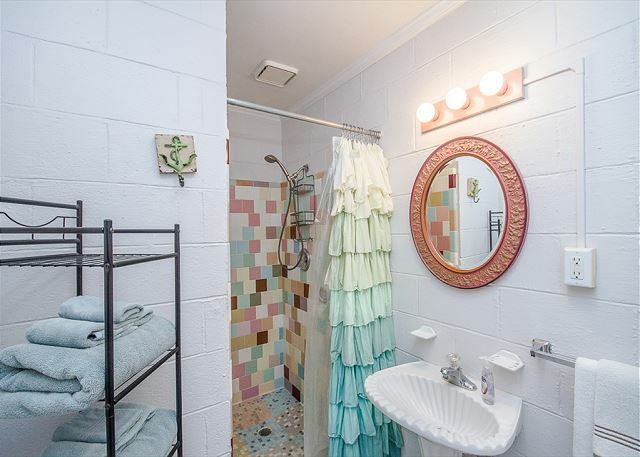 There are 3 full bathrooms in this home, two downstairs and one upstairs with its own king bed. Daybed and stairs to upstairs master bedroom and bath. Upstairs king bedroom (with ensuite bathroom). Wonderful details in the dining/ seating room. Dining room full of fabulous and wonderful details, like this oyster shell chandelier. French doors lead to screened porch. 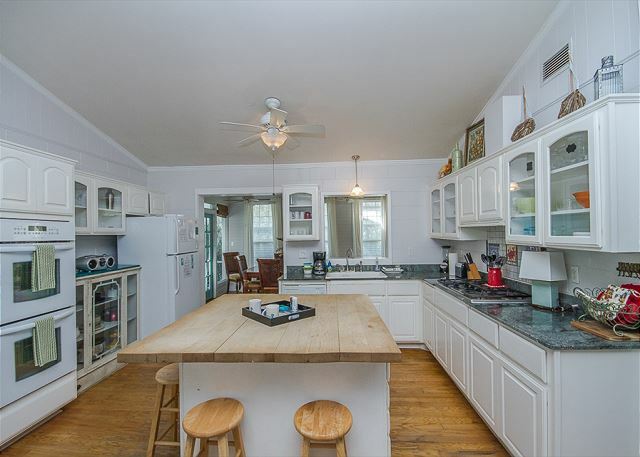 Kitchen is to your left and has a pass thru window for easy serving and clean up. Dining room has an extra seating area. 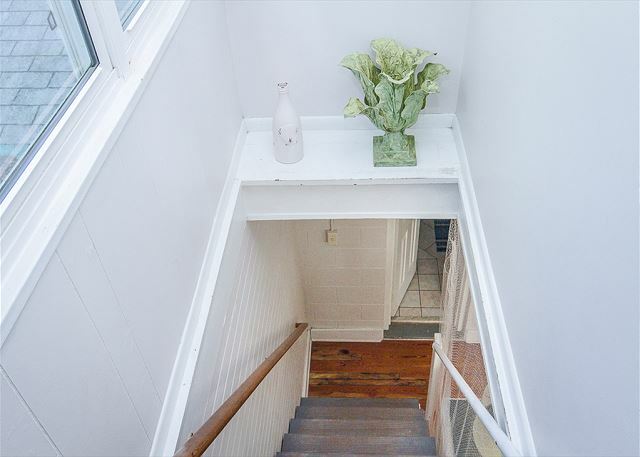 Stairs lead to upstairs king bedroom. Stairs to the king bedroom suite upstairs. Bathroom details. Lush towels and fun touches. Tybee Twins front yard. 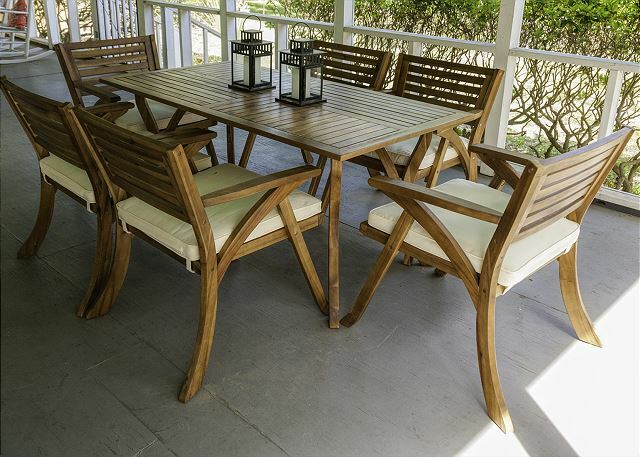 We have a wonderful screened n porch we want to share with you! And, a fantastic new heated swimming pool in the backyard! 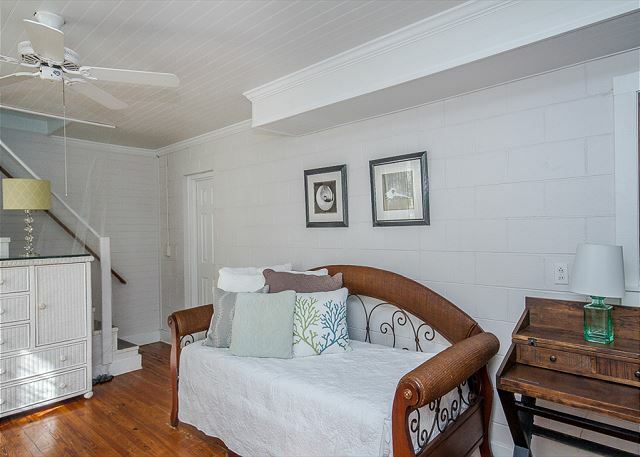 Pet-friendly Tybee Twins has three full bedrooms and three full bathrooms. A rare treat. Now with added HEATED POOL! King bedroom #2 ~ upstairs. Has its own full bathroom. King bedroom upstairs with private full bathroom. It's the only room upstairs. Stairs leading upstairs to the king master suite with private en suite bathroom. This is the only room upstairs. Let's look at this tub again, shall we? Best features include pet-friendly and 3 bedrooms plus 3 FULL BATHS! This will be a great cottage for family vacations, girlfriend getaways and everything in-between! Each bedroom is unique and decorated in perfect beach style. Calm and relaxing, the master suite features a King bed and has its own en-suite full bath! 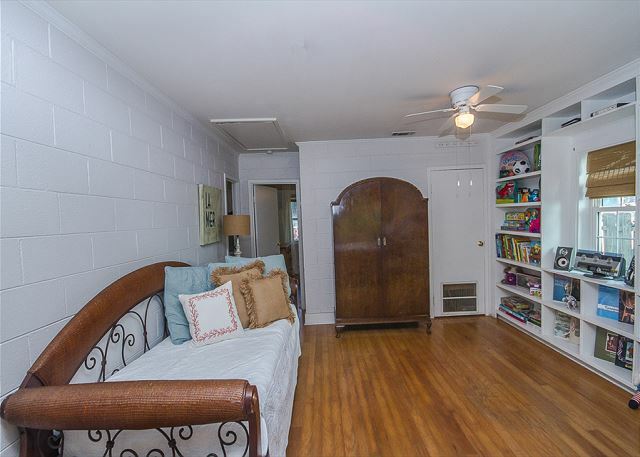 Downstairs, 2 additional bedrooms, 1 with King bed and 1 with 2 twin beds (perfect for the kids!) 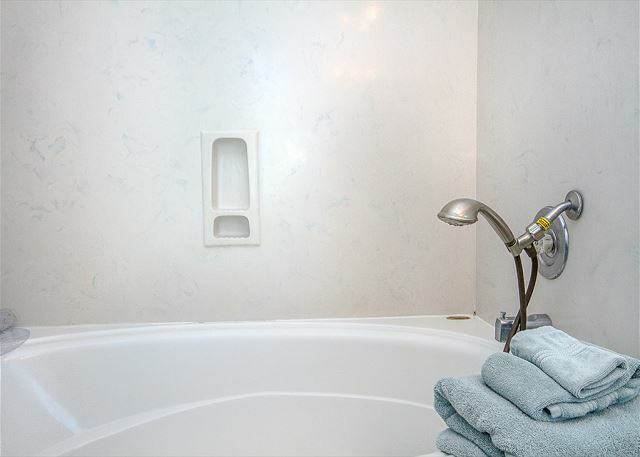 There are 2 full baths with showers downstairs. PRIVATE POOL and fully fenced-in back yard! Large, open kitchen/living room/dining area with gorgeous natural light, electric fireplace, plenty of comfy seating as well as 2 twin daybeds for lounging, reading, or catching that super-relaxing beach nap!! 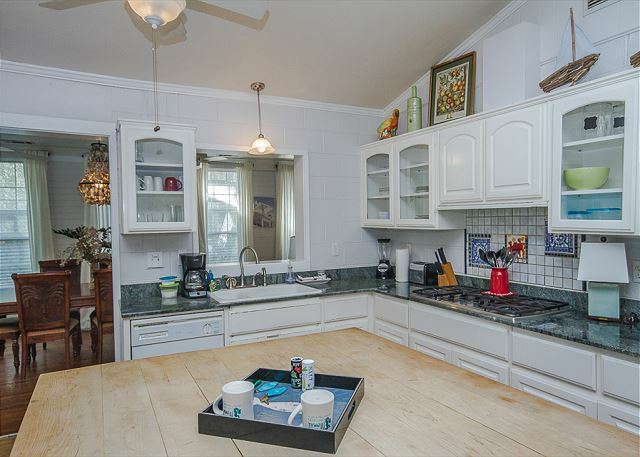 Imagine cooking your favorite Tybee seafood dinner in this adorable cottage kitchen! 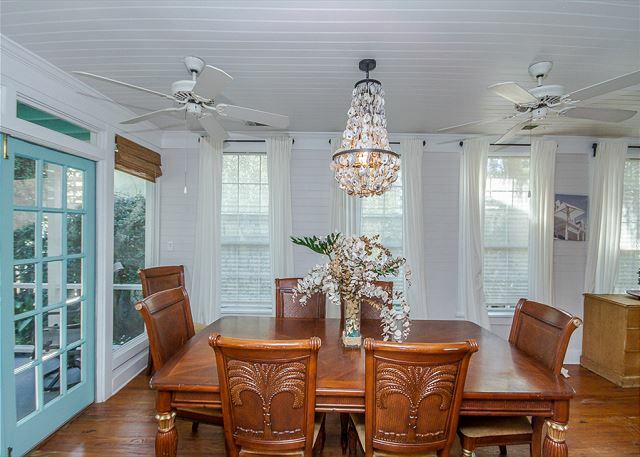 Beautiful dining area complete with oyster shell chandelier; beach-perfect!! 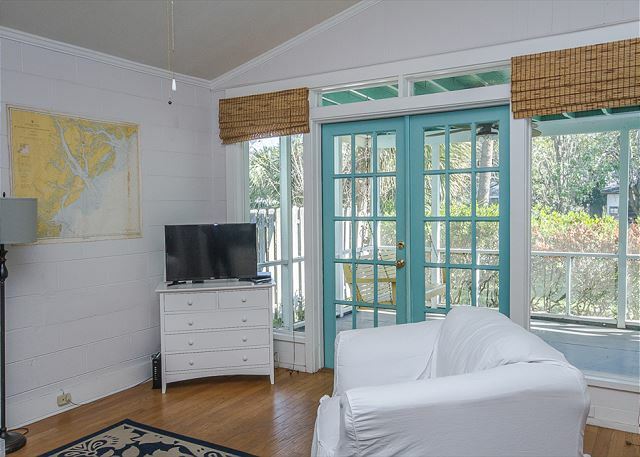 The spacious screened porch is the perfect place to hang out with morning coffee (Mermaid Morning Bliss of course! #MMMBliss!) or just relax and enjoy your beach getaway! Also a great place for pets to hang out! 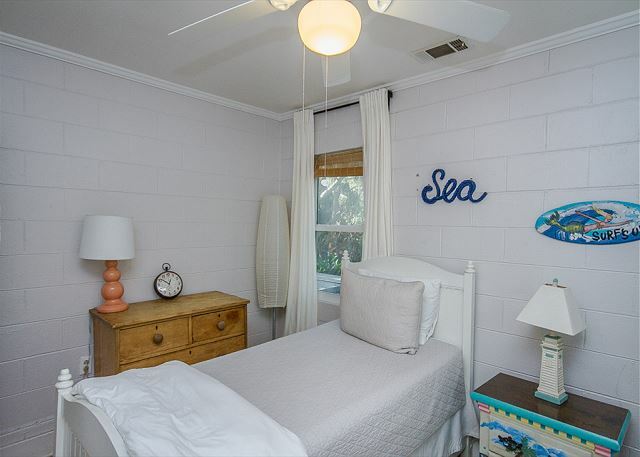 Beachy décor details and plenty of vintage charm make this the perfect addition to the Mermaid Cottage family! Around the corner and only 6 houses away from some of our other Mermaid Cottages; Blue Heron and Dutton-Waller cottages. *NOTE: Pool is not heated. Complimentary parking for 2 vehicles. PLEASE NOTE all pet friendly homes require an additional pet fee. Please pick up after your pets! No pets in pool! Family Dogs Welcome, Pets Welcome! 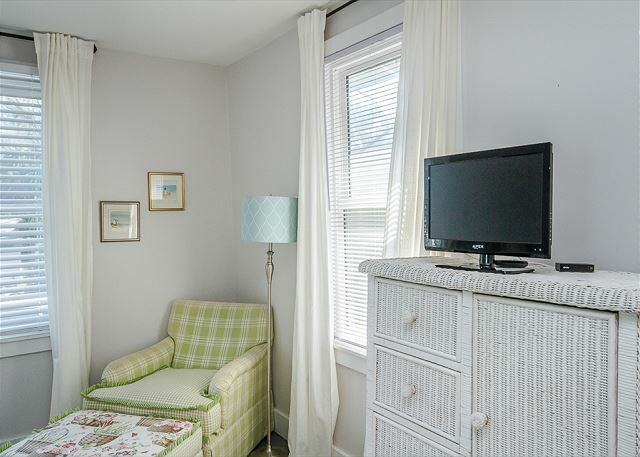 Tybee Twins is a spotless, well-appointed and spacious rental property in a quiet neighborhood just a few blocks off the main strip and beach. The weather was a bit too chilly to enjoy the pool but the backyard/pool area is lovely and private. The bedrooms and bathrooms fairly basic but comfortable and very clean. The location is perfect - quiet neighborhood but easy walking distance to restaurants and bars. And the property management company was attentive without being intrusive. We enjoyed our stay at Tybee Twins and hope to be back. We were six girlfriends on our annual Halloween vacation. 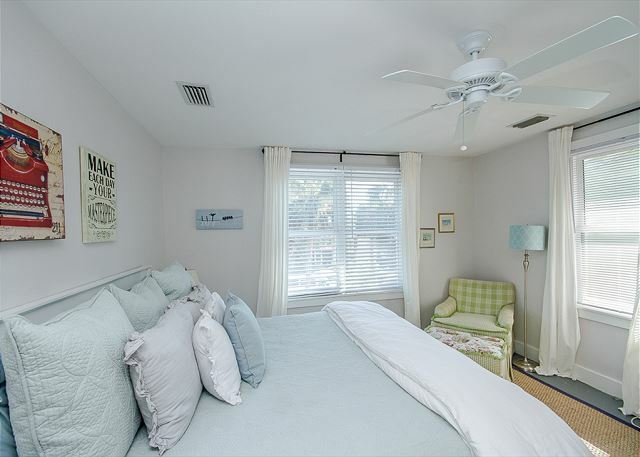 Tybee Twins is perfectly located with shopping, restaurants and the beach all within walking distance. The house is charming and easily accommodated six women. There were a few minor issues that were communicated to the leasing agent, but we would highly recommend this property. Overall all we were pleased with the home. It was clean and well appointed. The only downfall was the pool was out of commission and the staff did everything possible to rectify the situation. to everything on the island was easy. The pool at Tybee Twins was a great perk for the kids. We all hated to leave! The Twins cottage was a perfect layout for our family.We have 2 grown sons that are married, so everyone had their bedroom and bath. The screened front porch was our nightly location for playing UNO and relaxing. Enjoyed the pool also. Thanks so much for the easy checkin too. It was super easy to book, WITH two big dogs. I revived tons of information about the rental explaining everything. 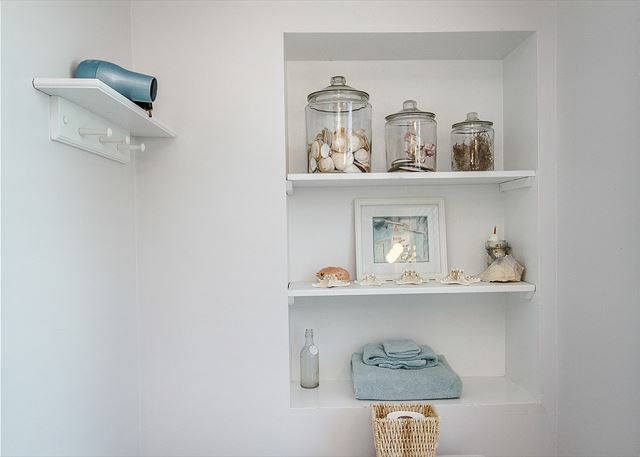 Easy entry, clean and beachy fun decor! Wish we could have stayed longer. Tybee Twins was a wonderful home for the week! Vacation with husband, Mother, Brother and 2 fur babies, house had space for everyone! House was very clean and the furnishing very comfortable. Beautiful pool and fenced in back yard. Our favorite was relaxing on front screened in porch! 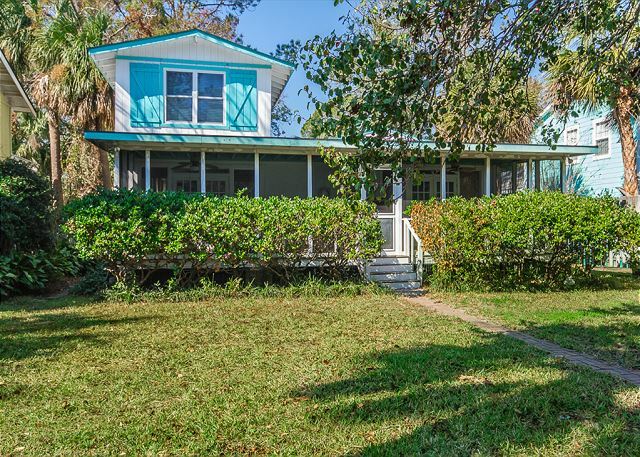 House wad in great location to enjoy all Tybee stores and restaurants. We rented golf cart for the week...great way of getting around. This was our second time in Tybee...We will be returning! This house and the staff at Mermaid Cottages are above and beyon! My family have been renting homes on Tybee for 8+ years and this is the best experience we have ever had. The home was off the ocean front, which usually isn’t good for me but this was the best part. The home is tucked only blocks away from the beach but you are back just enough to be in such a secluded spot. Quiet and peaceful. It felt like home the moment we arrived. The home was super clean and bigger than we expected from the photos. I cannot day enough about how wonderful this house and location are. We are already planning a yoga retreat and want both homes in September! Such a wonderful experience!! Rented Tybee Twins as a 3 month rental for a work contract. Started the week Irma hit so had a lot of damage on the Island post-hurricane. The house had some storm issues but the Mermaid crew was always on top of our needs. The home is now undergoing renovations and is getting a new pool in which is nice. The home has all you need for your stay. Especially loved the screened porch and large king size beds. Convenient walk to beach pier, restaurants, and the river as well. 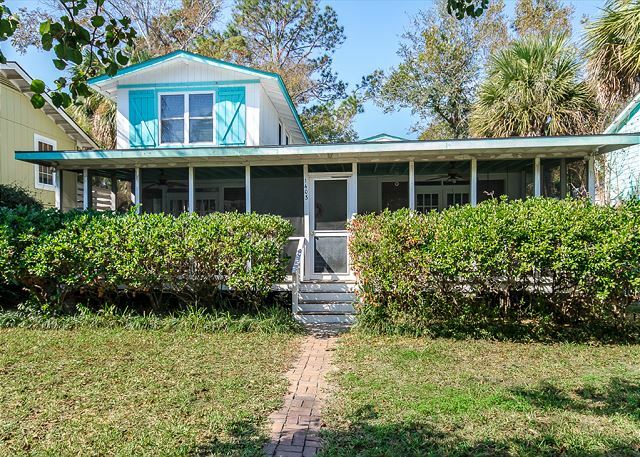 We have been visiting tybee for 10 years and wanted house on 5th to be near friends who own home there. Were happy with this rental only issue we had was water pressure in showers- master had hand held shower head. The property met all our needs for the week! I really didn't want to give any negative feedback because the ladies are super sweet. However, the bed in master bedroom was sinking in middle, we slept in it the first night only, but discovered there were major cracks in the back and side of the headboard, making it unsafe to sleep in. We ended up not staying our last night after finding a roach crawling in our bed. My husband called and spoke to Debra who was super nice & apparently roaches are common in the south, but no thank you...I do not want to bring those things home with me! (There was pest control next door the day before, so I'm sure some may have scurried over..YIKES!) So, we cut our trip short and left that night. Also, we did the majority of the cooking in the cottage, so when we went to run the dishwasher, discovered the flap to close (that holds the detergent) was broken. The sofa is VERY old and broken down. Overall, it's a pretty place, but needs some fixins. I would ONLY recommend this place IF they fix the bed and other broken down items. Thank you so much for bringing this to our attention about the headboard and bed. we will certainly address this asap. Unfortunately the bugs are part of living on a sea island during the summer. despite keeping the home very clean and having the home sprayed, we do have bugs. Thank you again for your feedback- we'll continue to work to make our homes the very very best possible! Diane and the mermaids. We booked this because it had three bedrooms and three baths so that each couple in our family could have their own space. It worked out great. Lots of room to spread out and the ceiling fans in each room were handy. Not as close to the beach as we would have liked and ended up having to drive there and to dinner each night. The appliances were in good working order. Our breath is held every year until we can once again pay a vacation week to Tybee and to Savannah, GA. Our 6-day vacation couldn't have been better. It was our second consecutive year staying at the pet-friendly Tybee Twins rental home. It was a blessing we stayed in the rental because as the main floor is constructed of cinder block, there happened to be a significant storm that passed through one evening and we felt safe bunkering in one of the window-free cinder bathrooms. 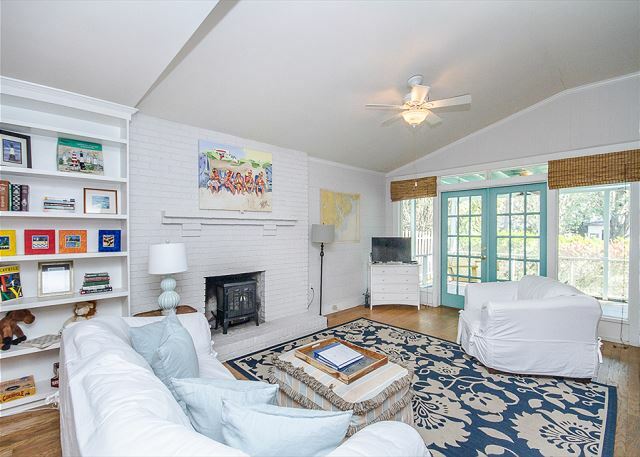 Besides the safety of the well constructed cottage, the location could not be more convenient, centrally located with a short walk to the beach, the back river, A.J. 's Dockside restaurant, and the beach shopping district. On a side note, our vehicle keys must have fallen out of our jacket pocket while on a walk and after checking out of our rental early Friday morning, we met the house cleaner, Tara, who suggested a locksmith company she has used in the past. The company came out and made a spec key so we could drive back home. During that process, we met several nice employees who are employed by Mermaid, each very cordial and friendly. They made our ordeal much easier and less stressful had they not been there to buffer our situation. (For the record, our keys were in the pocket of a beach jacket that was left at AJ's and they mailed us both within days! Their staff too was professional in assessing the matter.). Thanks to all! The house was prettier than the pictures! Very roomy and comfy! Would stay here every time! Loved it!! The house was clean and had everything we needed in it. Enjoyed our stay! Really enjoyed our stay at Tybee Twins! 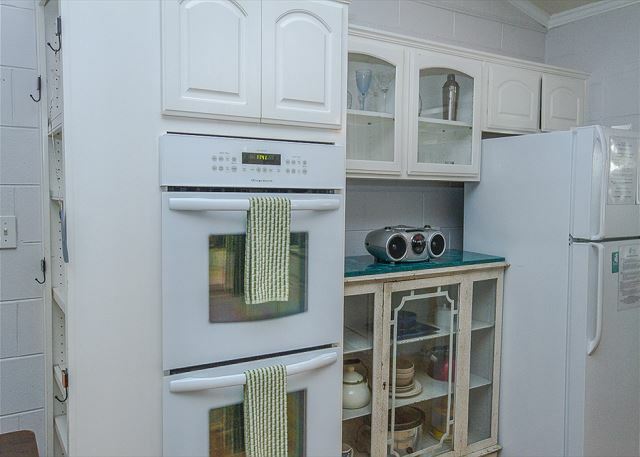 This home is warm and comfortable, stocked kitchen with all the necessities. Upstairs master bedroom and ensuite is very comfortable and roomy. Location of the home is easy access to the beaches, shops, and eateries. We stayed 2 nights in Tybee Twins in April. The house had ample space for 5 persons - it was very clean, cute and well organised when we got there. There were ample kitchen supplies - except for wine glasses. I asked for glasses to be brought over - and my request was promptly fulfilled - THANKS! The only negative thing about the house/experience was the location. The view across the road was HORRIBLE - the house across from us is a real PIGPEN - full of garbage and stray cats - the guy there was firing up his fire pit the ENTIRE day, which basically smoked us off the balcony. Something should really be done to clean-up that property, as it really takes away from the experience of tourists like us. All in all, I would definitely recommend another property from Mermaid cottages - in our experience, the company was extremely professional and the property very cute and clean inside. This was our first trip to Tybee. Beautiful property, easy reservation/check in. We were very satisfied with our cottage. Mermaid Cottages did it again! Jan & Dianne went above and beyond to make our annual girlfriend getaway the BEST! Tybee Twins was beautifully decorated and in a perfect location to the shops, beach & restaurants. We can't wait till next year! P.S. Tybee is our 2nd home & we loved seeing how the community came together after the hurricane to take care of each other. We had looked forward to our first stay on Tybee Island. Unfortunately, Hurricane Matthew altered those plans. Since we were flexible with our schedule, we were able to wait four days after we had originally scheduled to stay at Flips Flop House, a Mermaid Cottage, and the great Mermaid ladies were able to get us into Tybee Twins for a long weekend. They did everything they could to keep us up to date on what was going on on the island after the storm, and as soon as visitors were allowed back, they informed us and told us what conditions would be like if we came. We enjoyed our 4 days on Tybee and in our cottage. Had no tv or wiifi due to the storm, but that did not keep us from having a fun stay. And the Mermaids made sure I got the bath mat and shower stool I had originally asked for, dropping it off on our porch the day I requested it. 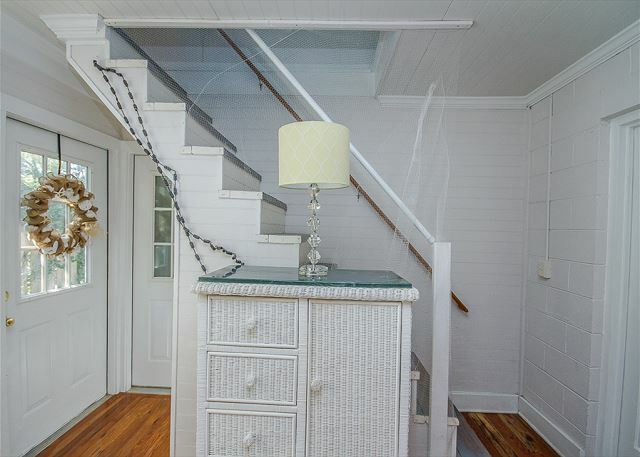 If you want to visit Tybee, stay in a neat vintage cottage, and get awesome customer service, come to Tybee and stay in a Metmaid Cottage. I want to Thank Diane and her staff for making our Peace, LAUGH, & Hoopiness Women's Retreat so great :) Our accommodations were perfect! 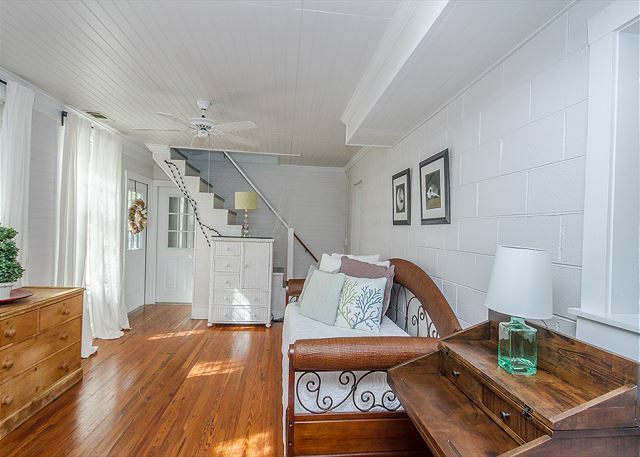 I highly recommend using The Mermaid Cottages for your next adventure to Tybee Island! Tybee Twins was wonderful! The house was super clean and welcoming on our arrival. It’s in a great location, walkable to both the ocean front and the back beach, as well as great restaurants (AJ’s and Tybee Social Club). The light-filled master suite upstairs was pure heaven, extremely relaxing. The day beds on the main floor are perfect for after beach naps or reading. We especially enjoyed the very large screened-in porch and the porch swing! A bonus about the porch—it has hooks that can easily accommodated one of the very popular nylon hammocks. We had brought one along, so that was a big hit with our teenagers. The kids also love biking all over the island. (Tim’s Beach Gear delivers the bike rentals right to the cottage!) Sending special thanks to Mermaid Jan for all of her help! This was our 5th stay with Mermaid Cottages and as always our every need was met. More than that, we always feel we are among friends and coming home to our own summer community. And it’s always very hard to leave! We love Tybee Twins! So spacious and cool, tons of room for fun and family hanging out. An easy walk to the beach, back river and AJ's. Easy to use kitchen and huge screened front porch. Wonderful family experience and accommodations. Beach within easy drive or walking distance. Lovely cottage, plenty of room, and picturesque. Overall positive experience. House was well-equipped to have many more people stay there as we only had two adults. The partially fenced yard worked well for our dogs. Location was convenient to walk the island. The house had a few items that could use some maintenance (hot tub was not running, ceiling had a slight leak due to torrential rain storms, fence needs repair) but none of these items adversely impacted our perception of the property or the stay. Myself and the family for a weekend at the beach. Roughly 5 blocks from the beach but a quiet neighborhood. Actually worked out perfectly. We had a wonderful girls weekend at Tybee Twins! Everyone was wonderful to us every step of the way! Can't wait to come back! My wife and I decided to spend some time with my mother in Florida this early spring and to visit our daughter in Raleigh, NC and our son in Jupiter Island, Fl. While traveling to Florida my wife and I talked about the upcoming March birthdays of our two children. We thought it would be great to get everyone together and find a destination along the east coast that would make the drive the same for everyone. We heard about Tybee Island and since we have never been to Savannah, Ga or Tybee we started looking into the possibilities. We researched online and read the reviews and settled on Mermaid Cottages. We were SO lucky to find them! From start to finish they have been OUTSTANDING!! I was originally looking at a different cottage but Mermaid Jan suggested this one as our visit was in January and this particular cottage was offered at a discount. We had one really nice, unseasonable warm day so we rented bikes and explored the island. Mermaid Jan offered to set up a fire pit in the front yard before our arrival so we enjoyed roasting marshmallows and making S'mores one evening even though it was a bit chilly. 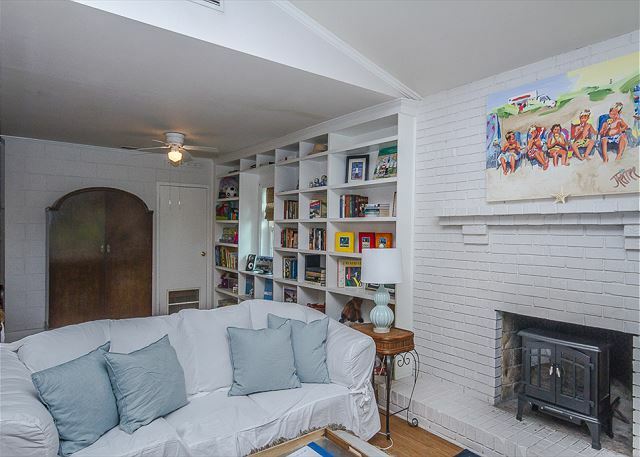 During the rainy, cold periods we stayed in, cooked, read and relaxed.This cottage is perfect for that with plenty of spots to curl up with a good book from the library and read or nap. If you're looking for more excitement, just head over the bridge into Savannah. We had a wonderful stay at the Tybee Twins. The cottage was very inviting and comfortable. Upstairs master suite was so relaxing. We had everything we needed. Hope to come back someday. 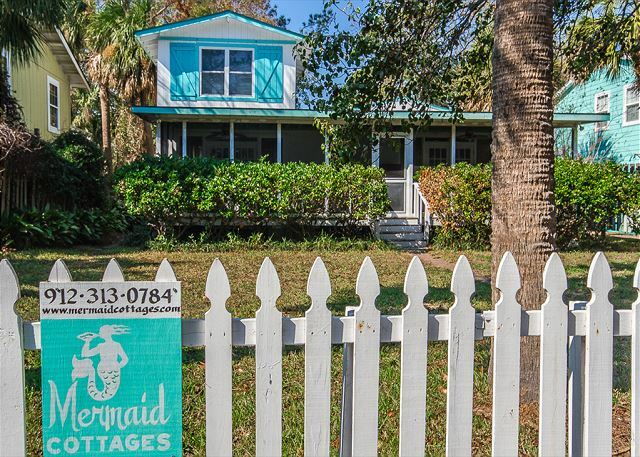 When I go to Tybee, I always search the Mermaid listings first. I believe I have stayed at five different properties, the past five years. Tybee Twins lived up to my expectations. The unique decor (oyster chandelier!) in updated, yet traditional beach houses is always awesome! Many Mermaid cottages have fenced yards. A must for me and my pooch! Whenever I have the least problem.... (I wanted the water heater turned up this trip) It is addressed immediately! Highest recommendations all the way!